Pennywise by Clown Premium Liquids is now here on shelves at E Cigarette Empire! This e juice will rock your socks and have you chain vaping like a boss! 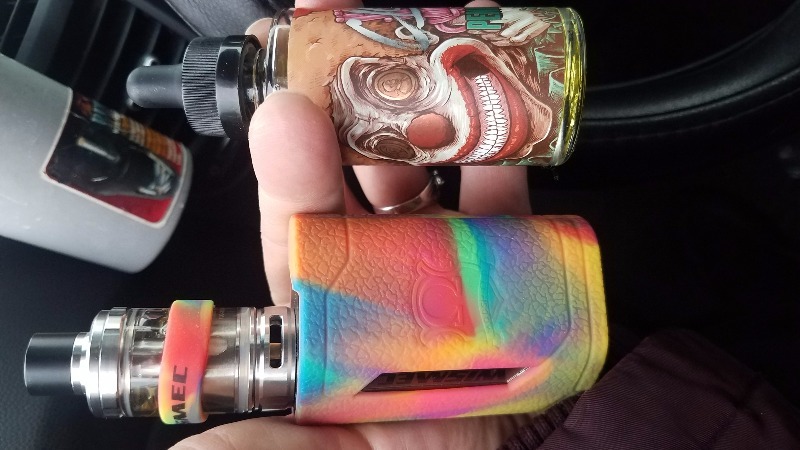 For those who are unfamiliar with Clown E Liquids let us explain. It is a flavor line from the e liquid brand Bad Drip. They are known to produce high quality liquids which all taste amazing. One of the shop’s favorites is Pennywise. It has the flavor profile of a Strawberry Watermelon Bubblegum. The inhale consist of the strawberry bubblegum which will make your mouth drool for more and more. Upon exhaling Pennywise is when the watermelon comes into play to complement the inhale perfectly! The throat hit is smooth and subtle. Your throat will not even notice that you are vaping which means no more coughing a lung up every time you go to vape! The bottle design is very unique and has amazing cover art. The e juice comes in a plastic bottle with a black child proof dropper lid. The label on the bottle is a darkish red and has a detailed picture of Pennywise The Clown. The clown art is so detailed that it extremely creepy to look at in a dark room by yourself. We carry Pennywise by Clown Premium Liquids in a 60ML bottle with nicotine levels of 0MG, 3MG, and 6MG. Come experience the darkside with this new fruit flavored e liquid. You will not regret it! Ordered a lot of juice because prices are the best! Everything came fast and packaged perfectly! Will definitely order all my vape needs from e cigarette empire in the future! Thanks e-cigarette empire! Juices arrived quickly & was exactly what I ordered. Ordered don't care bear & pennywise. My adv for EVERY day! By far my favorite juice for years, I just wish it was in stock when I go to re order. Pick up a couple bottles to stay ahead of any distribution issues.